One of my favorite ‘go-to’ appetizers to order out is bruschetta, but I am also a HUGE pasta fanatic. 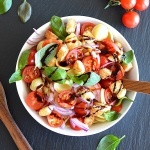 So I thought, why not combine the two in this Bruschetta Pasta Salad? My recipe incorporates toasted bread cubes and all of the typical ingredients in that classic favorite. 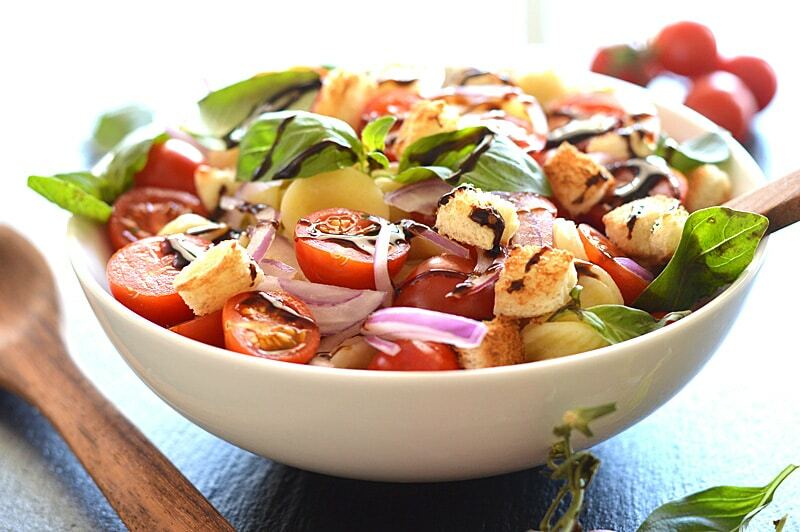 Kind of a twist on a bread salad. I chose orecchiette pasta, but you can use any shape you prefer. Organic cherry tomatoes off the vine, sliced red onion, fresh basil leaves and those abovementioned toasted bread cubes are topped with a homemade balsamic glaze. Season with salt and pepper, if desired. The homemade balsamic glaze is incredibly easy to make, but does require a modicum of patience on your part. The vinegar is brought to a boil in a heavy saucepan and then the heat is reduced to a simmer. Allow to cook for about 15 minutes or until thickened and syrupy. Remove from the heat and allow to cool completely (waiting is always the hardest part). It will thicken as it cools. Then it is ready to enjoy! P.S. The glaze stores nicely in a covered container refrigerated for up to a week. NOTE: While some balsamics are questionably un-vegan to some vegans (i.e. in regards to the practice of wine-making in general & the potential for the same here), as with wine, there are also some that are perfectly fine for us vegans. Since it is not yet common practice for makers of most wines to specify their process, there are a handful who will and if all else fails, many others are available online. I get mine at Whole Foods or any health food market. I usually double and serve this family-style, so portion size really depends on how hungry you (or your guests) are. We all just kind of help ourselves. If you make this recipe for Bruschetta Pasta Salad, snap a pic and tag me on Instagram @theveglife1 so I can see! Begin by placing the balsamic vinegar into a heavy bottomed sauce pan and heat to boiling. Reduce the heat and simmer for about 15 minutes or until thickened and syrup. Allow to cool completely. The glaze will thicken as it cools. You can add the agave and pinch of salt while it's cooling. Boil and drain the pasta. Give it a very brief rinse. This helps it keep from sticking together. Alternately, you can toss with a drizzle of olive oil which is what I did. Meanwhile, prepare the tomatoes by slicing in half. Pull off the basil leaves and set aside. Remove the crusts from 2-3 slices of bread and cut into large cubes. Toast until golden. All that's left to do is assemble and top with a drizzle of the balsamic glaze. I like to add a pinch of salt, but if you cook your pasta WITH salt, be sure to taste test first. It's easier to add then to to take away.